Wylaco carries Estwing brand framing hammers. If you can't find what you are looking please call! Estwing E24S Straight Claw English Pattern Hammer 24oz Features Estwing's Solid Steel Straight Claw English Pattern Hammers provide unsurpassed balance and temper. The head and handle are forged in one piece. Weight: 24oz (672g). Length: 13½" (343mm) Solid forged hammer. Full polished. English pattern head with straight claw. Leather grip. .. Description: Estwing's Solid Steel Rip Hammers provide unsurpassed balance and temper. The head and handle are forged in one piece. Features: All steel hammer with leather handle Patented design for unsurpassed balance and temper Head and handle are forged in one piece Meets ASNME specifications Overall Length 11" .. Features: Laminated leather grip Type Value Head Weight 12 oz Handle Type Straight Overall Length 11 in Head Material Steel Handle Material Steel Type Curved Claw Hammer Wt. 1.31 lb .. Description: Estwing's Rip Claw Solid Steel Hammer provide unsurpassed balance and temper. The head and handle are fully polished and forged in one piece. Our exclusive Shock Reduction Grip® is molded on and offers the utmost in both comfort and durability, while reducing vibrations caused by impact. Features: Smooth Face 16 oz / 448 g 13" / 330 mm .. 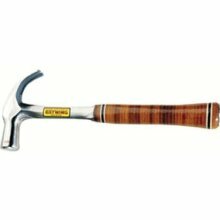 Features: Laminated leather grip Type Value Head Weight 16 oz Handle Type Straight Overall Length 12.5 in Head Material Steel Handle Material Steel Type Curved Claw Hammer .. Description: Estwing's Solid Steel Rip Hammers provide unsurpassed balance and temper. The head and handle are forged in one piece. Features: Smooth Face 20 oz / 560 g 12.5" / 318 mm .. Description: Estwing's Solid Steel Rip Hammers provide unsurpassed balance and temper. The head and handle are forged in one piece. Beautiful Leather Grip Features: Smooth Face Herad Weight 20 oz / 560 g Overall Length 12.5" / 318 mm .. Description: Estwing's Solid Steel Framing Hammer has a longer handle for more striking power. The head and handle are fully polished and forged in one piece. Our exclusive Shock Reduction Grip® is molded on and offers the utmost in both comfort and durability, while reducing vibrations caused by impact. Features: Milled Face Weight 22 oz / 616 g Length 13.5&q..
Head Weight = 22 oz Face Face Type = Smooth Head Tip Handle Type = Straight Grip Overall Length = 16 in Head Material = Steel Handle Material = Steel Point Type = Ripping Claw Hammer .. Description: Estwing's Solid Steel Framing Hammer has a longer handle for more striking power. The head and handle are fully polished and forged in one piece. Our exclusive Shock Reduction Grip® is molded on and offers the utmost in both comfort and durability, while reducing vibrations caused by impact. Features: Nylon Vinyl Shock Reduction Grip® Weight 30 oz / 840 g Length 16" / 4..
Head Weight 24 oz Handle Type Straight Overall Length 13 1/2 in Head Material Steel Handle Material Steel Type Curved Claw Hammer ..
Head Weight : 22 oz Face Type : Smooth Handle Type : Straight Overall Length : 13 1/2 in Head Material : Steel Handle Material : Steel Type : Ripping Claw Hammer ..
Head Weight = 22 oz Face Face Type = Smooth Head Tip Handle Type = Straight Grip Overall Length = 13 1/2 in Head Material = Steel Handle Material = Steel Point Type = Ripping Claw Hammer ..
Estwing Claw Hammer 24 oz. Nylon vinyl grip English pattern head Smooth face One piece forged steel Overall length: 13-1/2" 24 oz. Nylon vinyl grip English pattern head Smooth face ..
Head Weight = 20 oz Face Face Head Tip Handle Type = Straight, Cushion Grip Grip Overall Length = 13 1/2 in Head Material = Steel Handle Material = Steel Point Type = Curved Claw Hammer Estwing's Curved Claw Solid Steel Hammer provide unsurpassed balance and temper. The head and handle are fully polished and forged in one piece. Our exclusive Nylon Vinyl Shock Reduction G..
Estwing E6-22T Hammertooth Hammer - 22 oz. One piece forged steel construction, fully polished. Straightens twisted studs and joists, use on all 2X lumber. Nylon-vinyl deep cushion grip is bonded to steel handle for comfort and durability. Part Number: E6-22T Weight: 2 Pounds Length: 16.88 inches Width: 6.37 inches Height: 3 inches .. Description: Estwing's Patented Hammertooth® Hammers are great for straightening all 2x boards. The head and handle are forged in one piece. Our exclusive Shock Reduction Grip® is molded on and offers the utmost in both comfort and durability, while reducing vibrations caused by impact. Features: Head Weight 24 oz / 672 g Overall Length 16" / 406 mm ..